After graduating High School, Karleece Lapointe enrolled at the University of Manitoba for a career in marketing. “I thought I wanted to go into business but after my first year I realized that it wasn’t for me. That experience made me realize that I’m hands-on and want to be in a creative field. I also didn’t like the class sizes…I felt like a number”. “Karleece is a very creative designer, she has so many interesting and innovative ideas. 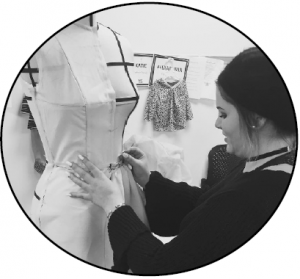 Her collection is a mix of so many different fabrics, textures and construction methods and I’m so excited to see it all come together” says fashion instructor, Lisa Dyck. Why did you choose Fashion as a career? What Fashion Designer are you inspired by? Can you tell us about your collection for the New Designers Fashion Show?